I spent Sunday afternoon at the Arts Festival in downtown Salt Lake City. The weather was absolutely perfect. We met up with a bunch of friends who we haven't hung out with in a while. It was fabulous to catch up with them. We wandered around looking at the art and a painting of a pair of high heels caught my attention. I went into the booth and saw painting of more shoes and boot, purses, cupcakes, cocktails and roller skates! It was like the artist knew me! 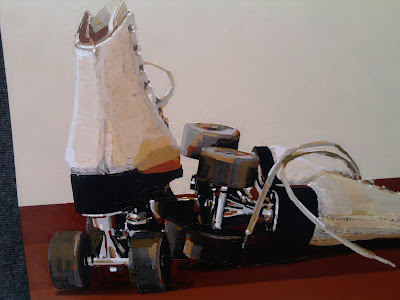 I really wanted to the painting of the roller skates but sadly, it was a little bit out of my budget. 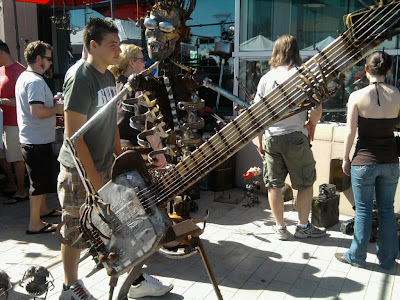 There were some funny metal works sculptures. I liked this guy. His ribs are bent crescent wrenches. Amazing! 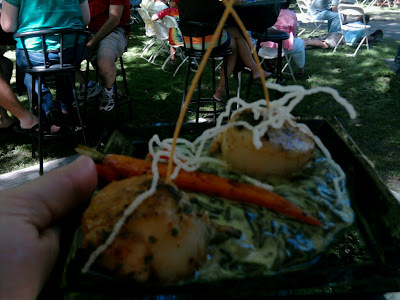 There are plenty of good eats at the arts festival too. In fact, the number of choices can be a little overwhelming. I'd read an article in the Trib that there was a booth that was selling tapas so I held out while everyone else made their food selections in the food row hoping to find the tapas booth in the festival. It took a while and was a little torturous waiting while everyone else was eating pizza, cheese steaks, and fish tacos but I eventually found the tapas! I ordered the diver scallops with creamed spinach. Delicious and quite fancy.